Kelsey Plum, the nation’s leading scorer at 31.7 ppg, Friday was selected as one of four finalists for the James A. Naismith award, presented to the top female in Division 1. 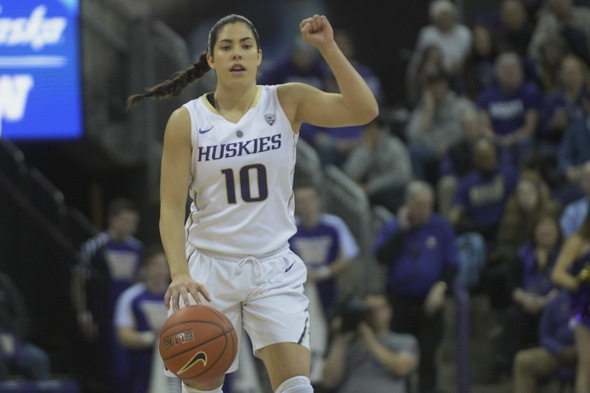 Washington’s Kelsey Plum Friday was named one of four finalists for the 2017 James A. Naismith Trophy, awarded annually to the nation’s most outstanding women’s college basketball player. The winner will be announced April 1 by the Atlanta Tipoff Club, which oversees the voting. The other finalists are South Carolina’s A’ja Wilson and UConn teammates Napheesa Collier and Katie Lou Samuelson. The winner is determined by a vote of current and former head coaches, former winners, conference commissioners and journalists. A senior, Plum is the nation’s leading scorer at 31.7 points per game. She is the first player in Pac-12 Conference history, male or female, to tally 3,000 career points. This year, she broke the NCAA career scoring record and became the third player in NCAA history to surpass 1,000 points in a single season. She has already been named espnW and Pac-12 Player of the Year. A junior, Wilson is the SEC Player of the Year and was recently selected as SEC Tournament MVP. She averages 17.4 points and 7.6 rebounds for the Gamecocks. Collier, a sophomore, was the American Conference co-Player of the Year along with Samuelson. She is second nationally in field goal percentage at 68.9 percent. Samuelson, also a sophomore, leads UConn at 20.7 points per game. The Naismith Trophy was first presented to Anne Donovan (Old Dominion University) in 1983. Other notable winners include Cheryl Miller (1984-86, University of Southern California), Dawn Staley (1991-92, University of Virginia), Lisa Leslie (1994, University of Southern California) and Diana Taurasi (2003-04, UConn). The No. 3-seeded Huskies (27-5) host No. 14 Montana State (25-6) at Alaska Airlines Arena at 6 p.m. Saturday in the first round of the NCAA Women’s Tournament. In the first game at 3:30 p.m., No. 11 Gonzaga (26-6) meets No. 6 Oklahoma (22-9). Plum will sweep all the awards. No one is even close. For those who have not seen her play, do go to the games tomorrow – she is a player.